Do tarot readings forecast the future–or change it? It’s fun for my clients, but always a little disappointing for me, when I tell them something they already know. 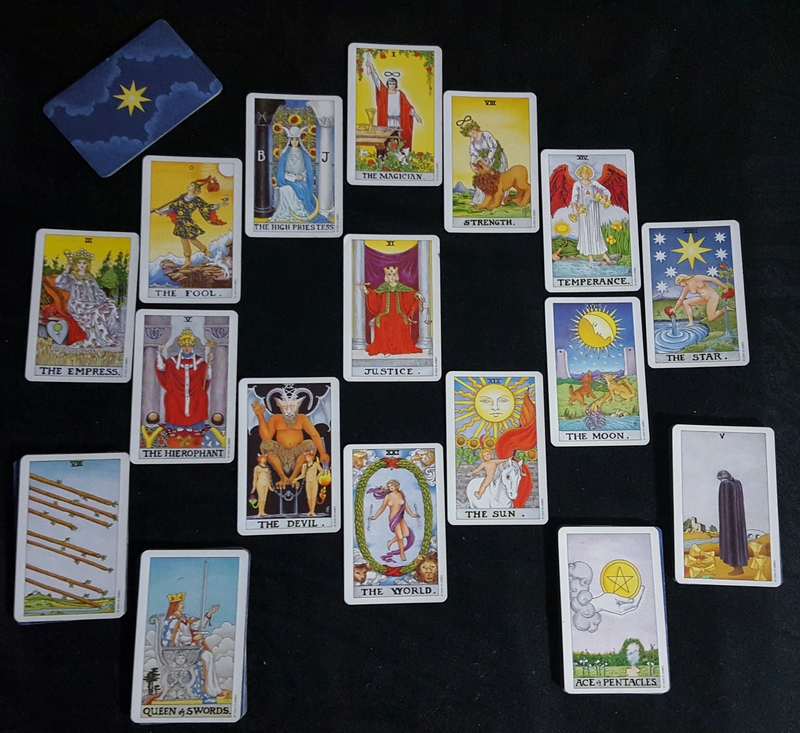 It’s nice to be told that a tarot reading is accurate, but on the other hand, if you know the reading is accurate at the time that it is given, that means that you already knew the information that was provided. Which, to me, says, why would you spend money on a reading to find out something you already know? Where is the value in that? So, I’ve spent a lot of time thinking about what it is that makes readings worthwhile. It seems to me that the main value of being told what you already know is that it is validating. If the cards say that you’re being treated unfairly at work, it can feel really good to hear that, even though, if you are being treated unfairly, you’ve likely already noticed it. But until that moment, perhaps a part of you was thinking, is it just me? am I just not understanding what’s happening? am I too close to the situation to really see it? So I understand that it can feel good to have the cards validate your own intuition. And for some clients, it’s a matter of my cards validating your cards–I often hear from clients that the cards I drew are the same ones that they have been repeatedly seeing in their own readings at home. But I also didn’t name it, “Tarot Fortunetelling.” Not that there would be anything wrong with that! It’s just not the main point of what I do (though my readings do seem to have good predictive value). I named my site “Tarot Salve,” because I think that the way I read can be very healing, and that tarot CAN be like a salve, taking away some of the sting of life events and acting as a catalyst to make things better. But though I’ve believed that for a long time, it’s taken me several years of reflection to figure out how and why healing through the tarot could be possible. What I’ve come to believe is that, just like in anthropology and quantum physics, the act of observation actually begins the process of change. When you observe something, you change it, even if you don’t intend to. It doesn’t matter that much if you are looking at the past, the present, or the future–time doesn’t really exist, anyway (spoken as someone who is massively punctuality-challenged!). I know that many readers focus on using tarot as a way to empower clients to make changes in their own lives, and I do that whenever I can, too. But experience tells me that even if you have no interest in making a change, you still may get one. Because the tarot reading changes YOU. That’s not metaphysics necessarily (though granted, the source of the information in the reading is metaphysical), it’s actually just science. Because if you take information and put it in your brain, your brain is going to process it. Because that’s what brains do. Whether you think about it consciously or unconsciously, it’s been noted. If you receive information in a tarot reading, that information is going to get picked up by your brain. You can’t unhear what has been said. (Or unread it, in the case of an email or chat reading.) It’s going to change you in big ways or small ones, depending on the information. And the dialogue goes both ways. When you say what’s going on with you, and a reader listens to you, that also changes you (and may change the reader to some degree as well). Those words and feelings may have been bottled up in you. When you release them to the universe by talking to another human being, there is often a sense of relief. One of the comments I most often hear from clients is, “thank you for being there and for listening!” Listening creates a space in which things that are ready to be released can rise up and be released. That changes you, and I believe that releasing what has been trapped in you begins the process of healing. So I’m going to go out on a limb and say that tarot reading doesn’t just forecast the future, it changes it, even if you don’t do anything different after your reading. This is even true if the changes that happen in the future don’t seem to be part of you. Sometimes, for example, I hear from clients that their relationships got better after their readings, that their partners suddenly seem more understanding and more affectionate, and even that their partners have gotten brave about making needed changes. The science-y explanation for that is that when you change, even in seemingly invisible ways, your partner changes in response. The metaphysical (and to some extent quantum physics-y) explanation is that when you look at a situation (again, whether it’s in the past, present, or future), you interact with it on all levels and that interaction changes things. That’s how tarot can heal. And that’s why the healing is so gentle, like a salve. Because it’s a just an observation, just a simple look at the situation, not even touching it really. And yet that tiny gentle quick look sometimes seems to change everything. Do you agree? I’d love to hear your comments about whether tarot has or not ever healed something for you–please share your stories in the comments section below. Previous Why I Knit Deck Cozies!